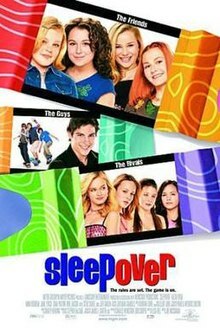 Sleepover is a 2004 American comedy teen film directed by Joe Nussbaum and starring Alexa Vega, Sara Paxton, Mika Boorem, Scout Taylor-Compton, Kallie Flynn Childress, Sean Faris and Jane Lynch. On the last day of 8th grade before their freshman year in high school, Julie Corky (Alexa Vega) has a slumber party with 3 best friends, Hannah Carlson (Mika Boorem), Farrah James (Scout Taylor-Compton), and Yancy Williams (Kallie Flynn Childress). As a quartet, they end up having the adventure of their lives. A group of popular girls, led by a former friend of Julie's, Staci Blake (Sara Paxton), challenge the girls to a scavenger hunt. The prize will be a coveted lunchtime seat near the fountain in high school. The losers will have to sit at tables near the school's dumpsters. The list includes things like a picture of the girls with a date inside an exclusive night club, the insignia from a local private security firm, and a pair of boxers from Steve Philips, (Julie's crush), and to dress an Old Navy mannequin with their own clothing. The girls sneak out of Julie's house, and use Yancy's father's Hypermini to travel to various locations and get the required objects. Along the way they dodge a Patroltec security guard (Steve Carell) and try to keep Julie's parents (Jane Lynch and Jeff Garlin) from discovering that they are gone. During their scavenger hunt, Steve Philips sees Julie skateboarding in a dress and is impressed. Later the girls meet up at the school dance, but both have acquired all the items on the list. Stacie suggests a tie breaker, where the group which is able to get the crown from the homecoming king or queen will win. Staci catches her boyfriend, Todd, dancing with another girl who claims that she has been Todd's girlfriend for six months. After the two break up, Staci shares a dance with a scruffy skater friend of Julie's. Yancy shares a dance with a boy who moved speakers for a summer job and who she met earlier in the night. Steve ends up named homecoming king and picks Julie as his partner for a victory dance, giving her the crown and ensuring victory for her friends. After the dance, Julie and Steve are about to kiss when they get a call from Julie's brother that their mother is headed home. The girls race home and pretend to be sleeping just as Julie's parents check on them. The next morning at breakfast, Julie's mom confronts her asking "exactly" what they did last night, showing Julie the scarf she had dropped in the Cosmo club. Surprisingly, she is not mad but confesses it is difficult to believe how fast Julie is growing up. Then Julie says goodbye to her friends and finds Steve waiting inside her tree fort, where the two begin kissing passionately. The film ends and it's their first day of freshman year in High School with a scene of Staci and her friends, now in high school, eating their lunch by the school dumpsters among the trash and the social rejects. Alexa Vega as Jules 'Julie' Corky, a fourteen-year-old girl who has a sleepover with her best friends to celebrate the summer. Sara Paxton as Stacy Blake, one of the queen bees of the school and a typical middle school mean girl. She and her best friend Liz plan a scavenger hunt for her, Julie and her friends, which Hannah ends up changing the rules so Julie, Farrah, and Yancy can sit at "The Fountain" freshman year of high school. Mika Boorem as Hannah Carlson, a teenager who is the best friend of Julie, and ends up moving to Vancouver. She is somewhat the leader of the group because of her leadership and determination. Scout Taylor-Compton as Farrah James, Hannah and Julie's best friend and is known for being the fashionista of the group. Kallie Flynn Childress as Yancy Williams, a slightly over-weight teenage girl, who is very self-conscious and worries about what people think about her. Sean Faris as Steve Phillips, the local hottie of high school. At first he doesn't notice Julie, but then later he notices her after he sees her skateboarding with a dress on. Steve Carell as Officer Sherman Shiner, a security officer in Julie's neighborhood, whom the girls encounter multiple times that night. Sam Huntington as Ren Corky, Julie's older brother who still lives at the Corky house, and covers for Julie and her friends when they sneak out of the house. Jane Lynch as Gabby Corky, the mother of Julie and Ren Corky, and the wife of Jay Corky. Gabby is an overprotective mother and doesn't want her daughter, Julie, to ever get into trouble, but during the sleepover she has plans of her own to go to "The Cosmo Club". Jeff Garlin as Jay Corky, the father of Julie and Ren Corky, who is a plummer. He has his heart obsessively determined on fixing the water in their house during the sleepover. Evan Peters as Russell "SpongeBob" Hayes, SpongeBob is a very clumsy skateboarder who has his heart set on making Julie fall in love with him. Brie Larson as Liz Daniels, the other queen bee and Stacy's best friend. Liz is a little bit more popular than Stacy and writes down almost everything on the scavenger hunt list. Johnny Sneed as Mr. Corrado, the girl's teacher. Ryan Slattery as Peter, Yancy's love interest who treats her well. Katija Pevec as Molly, one of Stacy and Liz's best friends. Eileen April Boylan as Jenna, one of Stacy and Liz's best friends. Thad Luckinbill as Todd, Stacy's ex-boyfriend. Alice Greczyn as Linda, Todd's new girlfriend. Shane Hunter as Miles, one of Russell's best friends. Hunter Parrish as Lance, one of Russell's best friends. Douglas Smith as Gregg, one of Steve's best friends. Max Van Ville as Sean, one of Steve's best friends. Summer Glau as Didi, a lonely ticket girl. Laura Monteiro as Jennifer Allen, the queen of the dance. The film opened at #10 in the box office with $4,171,226. The film would later make $9,436,390 in the United States and $712,563 internationally, resulting in a $10,148,953 gross worldwide, on a $10 million budget. The film received overwhelmingly negative reviews, although audience reception was more positive. On Rotten Tomatoes, the film currently holds a 15% critic rating based on 99 reviews as well as a 54% audience approval rating. Scholastic Inc. released a novelization of the story in May 2004. The novel was written by American fantasy and science fiction author Suzanne Weyn.